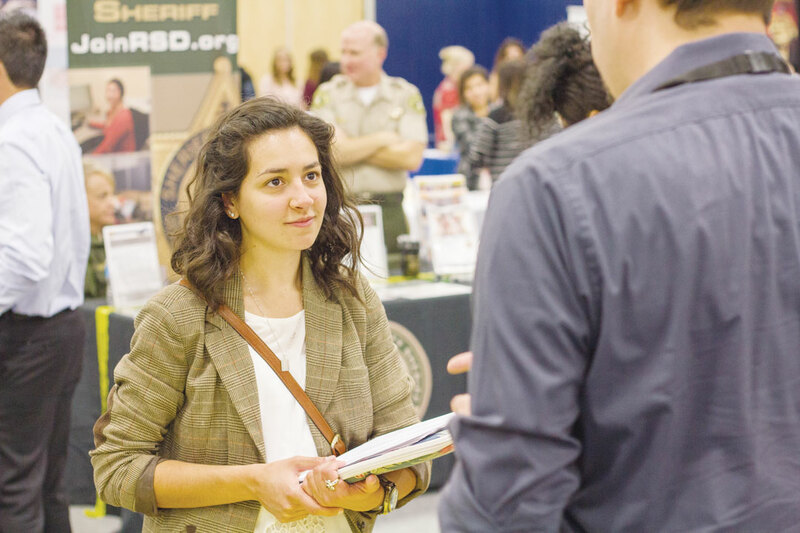 Students had the opportunity to visit with employers and make connections at the Government and Non-Profit Internship Career Fair that took place Nov. 4 at California Baptist University’s Recreation Center. Seventy-seven employers were present, from the Make-A-Wish Foundation to Design West Engineering, offering opportunities to suit anyone’s major. For Michaela Angelus, sophomore business administration major, this was her first time attending the fair. Amber Greenawalt and Daniel Contreras, both junior sociology majors, echoed similar views. Greenawalt came for similar reasons to Angelus, and said she came to get experience and gain new ideas. Contreras said he attendend for advice for a future career and said he would recommend it to other students. The students mentioned there was a sufficient number of employers present and Contreras found one in particular to suit him—the Riverside County Sheriff. “The Dream Center Human Trafficking Program has probably been one of the most consistently popular ones,” said Morgan Teruel, Career Center counselor and employer relations. The Design West Engineering, The City of LA and Caltrans also gained a lot of interest. Patrice Hill, an employer representing AmeriCorps CalPREP program, said this event is beneficial for students because of the job opportunities. Hill explained what makes a good first impression to an employer. Hill said they were pleased with the presentation of the students.